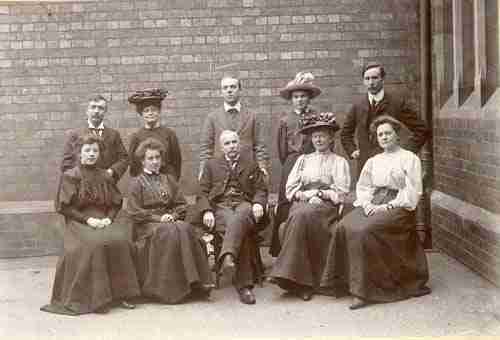 This photo of teachers at Bath Place National School was taken in 1905.
history@bathplace is a multi-media social history project documenting the history of Bath Place Community Venture, from its inception in 1859 as a National School up to its present role as a facility for the whole community. The project records and celebrates stories and achievements of Bath Place, local people and the surrounding area of South Leamington, through photographs, oral history recordings and written historical research. Images and related sound clips from the collection are held on the Commanet database. The ‘jewel in the crown’ is our archive database held on Commanet, which includes photos, sound files and video clips ranging from old school photos, and histories of local people and places, to memorabilia from over 30 years of community activism and campaigning.